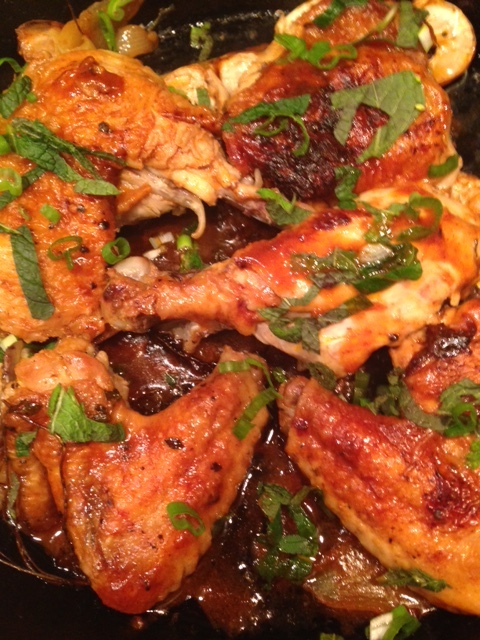 Eons ago I learned to make Vinegar Chicken. When I feel the yen for fried chicken, this is my go-to response. My method is so simple that it could be called “cooking without a recipe.” The dish finds a place in most French cookbooks, and it seems an odd combination. When we stop and think, however, we realize that the acid in the wine vinegar boils away after its tenderizing touch to the protein, and the essence of wine is left to make a lovely glaze. I didn’t think it could work, but it’s magical. Almost everyone enjoys fried chicken, yet we know we shouldn’t overindulge in fat. Here’s a quick week-night chicken sauté doused with a splash of basic wine vinegar that lifts a simple bird to irresistible flavor. The Vinegar Chicken (sounds much better as Poulet au Vinaigre) combines the golden skin of carefully turned pan-fried poultry plus a rich, amber glaze with minimal fat. Remember that chicken cooked ON the bone has lots more calcium as well as more nutrition and taste all around. The Whole Food concept of eating doesn’t mean boneless, skinless. Likewise many French cookbook recipes call for larger quantities of vinegar, unnecessary in the US where vinegar has a higher acidic content. This smaller dose late in the cooking gives a savory yum—the umami of perfect deliciousness. Wanting fried chicken without the FRY, then simply sauté and seal in the lip smacking flavor with vinegar. Dry chicken pieces with paper towel; sprinkle with salt and pepper. Heat oil in heavy skillet (cast iron if possible) and sauté chicken over moderate heat until golden. Strew in garlic cloves after chicken has cooked 5 minutes. (Cover pan with spatter screen to contain grease.) Turn the chicken several times as it cooks, making sure it is nicely browned on all sides and done, 20-30 minutes depending on size of pieces. Measure vinegar into small cup near stovetop. Pour or spoon off excess fat. Reduce heat; quickly sprinkle over vinegar and immediately cover with lid. Simmer 5 minutes. Remove chicken to a warm platter, stir flour and tomato paste into dripping. Add stock or water and boil up to a rich sauce. Swirl in butter if desired. Pour sauce over chicken. Squeeze softened garlic from paper skins to enjoy along with the chicken. Serves 4. You are currently browsing the Mary Jo's Kitchen blog archives for April, 2016.